OK, SSM. Probably the most common question asked in these forums is "What brand of tires do you recommend?" In an effort to centralize this information, we'd like to establish a database of tire reviews. We'd like to encourage anyone & everyone to review their current or past tires here just to get the information posted. This thread is for reviews ONLY. Please do NOT begin discussion of tires in this thread. If you see a review & have a question, start a new thread, or PM the author of the review. Any post in this thread which is not a tire review will be deleted. In order to provide as much detail as possible, please use the following format for your reviews. If a particular field does not apply to you, feel free to omit it or respond with an "N/A." In order to save you time & effort, feel free to "Quote" this post & then remove the "quote" brackets & instructions before you edit what's left into your new review. Purchased from: Tire Kingdom, Valrico, FL. They ordered from Tire Rack due to Tire Rack's lower price. Dry traction: B+. Every bit as sticky as Paradas, Ecsta MX, Azenis. Wet traction: B. I don't often push my tires in the wet, so I won't go so far as to give an A, but they have not disappointed me yet. Road noise: A. Very little road noise, which was a pleasant change. Ride comfort: A. They ride like a touring tire- forgiving on rough roads. Overall Performance: B+. Quiet, great ride, and very good traction. Update 8/20/08: Rotated my tires in preparation for my road trip on Friday. I now have 20k miles on them, but I am bout to hit the wear bars on one pair, and have some minor cupping on the other. Both are worn more on the inside edges than outside, as per usual. So it looks like I will be getting new tires for Labor Day when I return. Total miles on this set should be about 23k. I'll be getting another 4 of the same. Update 9/02/08: 23k on the tires now, could probably last another few thousand, but I don't like to run them down to the steel belts. New set of 4 S-Drives on order at Tire Kingdom in Brandon, should be on the car Friday morning. Last edited by BillTheCat on Tue Sep 02, 2008 6:11 pm, edited 2 times in total. Was alignment checked/adjusted during installation? Checked, not adjusted. Overall Performance: B+; I've driven stickier track-day tires, and I've felt slightly better rain tires, but overall these tires are fantastically grippy! Would you buy the same tires again next time? Yes, definitely. After switching from stock DSST runflats to these I can honestly say that I've been won over- all of the hype about "Ditch the runflats! Ditch the runflats!" as seen on MotoringFile and NAM is totally true. These tires are also slightly wider than the Dunlop DSST's, but don't interfere with the MINI's lines at all- in fact, I feel they compliment the styling rather nicely. They look aggressive, they perform spectacularly, and the car now drives as though it's on a cushion of air... ride comfort is the biggest improvement, followed by grip/handling. 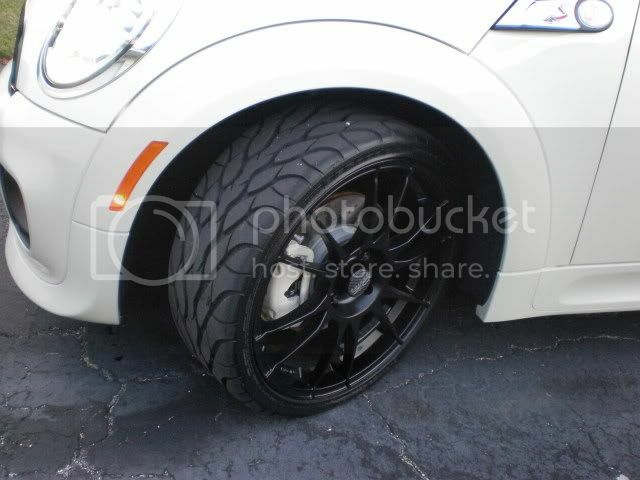 Overall, a truly excellent tire for the sporty MINI driver! I've only driven these tires for a while now, but thought I'd post up my findings. Overall they have great grip on dry pavement. Where my old runflats would break loose on hard acceleration, these stay planted. Haven't had too many opportunities to put them through a serious test in the turns yet, but with hard cornering around town they have yet to even hint at not holding. The only drawback I've found so far is that under hard acceleration (especially with uneven pavement) they tramline pretty severely. Really caught me off guard the first time. Seems to be accentuated in wet conditions. I think this happens partially because even though the tires are directional, the tread pattern does not mirror from left side to right. Instead the tread grooves all go the same direction. Wanted to add a few comments since returning from the Dragon. This was my first attempt at really testing these tires. And also the first time that I went through the Dragon without squealing tires or having any issues with either understeer or (purposeful) oversteer even when pushed. The car was well planted at all times. These tires held better than any others I've had so far. Can't wait to get to the track and REALLY put them through the paces. 2phun wrote: The only drawback I've found so far is that under hard acceleration (especially with uneven pavement) they tramline pretty severely. Really caught me off guard the first time. Seems to be accentuated in wet conditions. I think this happens partially because even though the tires are directional, the tread pattern does not mirror from left side to right. Instead the tread grooves all go the same direction. I'm downgrading wet traction to a B. On damp roads (like we had at the Dragon) they hold quite well. However, if there is water standing on the road, that directional tread pattern causes the car to pull pretty severely to one side. Definitely need to have both hands firmly on the wheel when driving in heavy wet conditions. I sure wish they had mirrored the tread pattern from left to right tires. After this rainy season, it might cause me to change my mind about whether or not I would buy these tires again. These tires are performing really well in wet traction and they seem to hold very well on dry roads. I haven't taken them to the Dragon yet to get a good comparison with my stock runflats, but my initial impression is that these will hold better and feel more confident. There is a little more side wall roll coming from runflats, but hopefully an extra 1 or 2 lbs. of air in the front will even that out. I almost went with the S.Drives because of the recommendations from here, but talking to Alex at Tirerack and a few different tire shops decided to go with these, hopefully I made a good choice. Motoring style: Speed Racer w/ Spirit! Track/Autocross use? Never been on a track. These tires not only look great, they perform great! They have a stiff sidewall which gives you confidence during hard cornering. The first time driving in the rain surprised me. I have never felt so much grip in wet conditions. All those grooves evacuate the water in a hurry. We have 17,000 miles on them so far. I have been rotating them every 5,000 miles. They look like they have another 17,000 miles left on them. I also had these tires on my last MINI. Same size as above. I only put about 5,000 miles on them before the lease went back. They had a lot of track time on them. Approximately 10 auto x events and 3 track days. They were pretty good for street tires. There are a few better street tires for auto x. They held up pretty good for the abuse they took. They had a lot of road rash on the corners and sidewalls. I would not buy them for use as a street tire in auto x. Falken and Dunlop make a sticker street tire. Was alignment checked/adjusted during installation? No. I've only got 300 miles on em, but so far I love everything about them. The turn in is quick and sharp. Even with a pulley, intake and exhaust you have to really work to break them loose on take off, especially after they really warm up, which means you can get on the gas a lot quicker off the line and not worry about wasting valuable time spinnin the wheels. Corners I used to take at 50-60mph on my Hankook Ventus RS2 Z212s are now 65-75mph, the confidence, control and predictability is just SO much better. On long sweepers at 100mph+ you definitely feel more planted and better connected with the road. The first thing I noticed...when I hit the brakes coming out of the installer, I knew it right there, the grip was incredible. I drove on em in the rain for the first time today, best ride I've ever had. Even during a torrential down pour they kept me feeling confident and offered very little hyrdo-planing, and only then it was at speeds I probably shouldn't have been driving considering the conditions. The road noise and ride are also excellent, better than the tires they replaced. I'll see how the noise lvls are though after they get some more wear on em. I've gone throught 2 sets of these tires, still love them. Only thing that's changed is road noise, it does increase pretty significantly after about 10k, 38-42 mph they really howl, but at highways speed the noise increase isn't that noticeable. Wet handling is not noticeable diminished as they wear. I got about 18k out of the first set, but I didn't rotate as often as I should have so only 2 were actually close to needing replacing. I have bent 3 rims(thanks NY for 2) since I got them though, I'll probably go back to 215/45 next time. Last edited by bosfordjd on Sat Mar 12, 2011 11:23 pm, edited 1 time in total. 2006 CR/B MCS, LSD, M7 STB, M7 16% Pulley, M7 CAI, M7 Aero Grill, Stealth Alta Sportone, Blacked Beltline, Red Schroth Harnesses, 17" Black OZ Ultraleggeras. Last edited by LgEnf on Tue Sep 20, 2011 9:10 am, edited 1 time in total. "The Cooper S purred away a real horrowshow. A nice warm vibraty feeling all through your guttiwuts." These tires barked pretty easily at Sebring, but held well. I cannot attest to the ride after 12K due to the suspension setup. Rain tires these are not. Wear has been ok, but we'll see after the next HMS day. HMS update: At 15K, they were great at HMS. I've worn them down to the wear line and the traction is great. No barking, no roll, they just stuck and performed as good as my old R-comps (225s vs these 215s). I may put them aside, saving them for the next track day rather than use them up. Last edited by sBox on Tue Sep 20, 2011 9:59 am, edited 2 times in total. Road noise: A-F (started out at "A" then after 25k slowly downgraded to "F"
Cost per tire: Hard to say as I got these on a warranty claim for the OEM Runflats; Tire Rack lists them $125 each. Was alignment checked/adjusted during installation? (Simple Yes/No) No. Now, as Paul Harvey said: Here is the rest of the Story: Car had 1168 miles on when I got the tires; had alignment checked at Dealer 04/20/11, 4128 miles on the car, 2960 on the tires. Would you buy the same tires again next time? (Simple Yes/No) Maybe – may go with something a bit less aggressive/longer lasting. If not, these tires are on the list to consider. 30,000 Mile Warranty through Discount Tire. At 13, 602 miles, does not look as though I’ll get 30K, but it might be closer than I think. I’m guessing that the tires will make 25-30 miles. Would you buy the same tires again next time? (Simple Yes/No): Absolutely. Additional comments: The minimal road noise is amazing. They are the quietest tire I've had yet on the car and the performance is getting better with the wear-in. Shadow and I just jumped on the Continental Extreme Contact DW bandwagon. Shadow had 111,111 miles on when installed so it will be easy to track how many miles I get out of these! Was alignment checked/adjusted during installation? (Simple Yes/No): No. Additional comments: Very quiet, especially compared to the BFG KDWs! Purchased from: Direct from supplier in south florida through my dad's shop. Wet traction: C- not too bad except really have to watch my starts from lights, easy to spin them if i'm not careful, no handling issues really. Road noise: C- a little noise, but not overly annoying. Would you buy the same tires again next time? If i needed cheap A to B tires, sure! Hopefully i can afford higher performance ones when these are done. Additional comments: Pretty much bought these out of the price, and my dad saying he's never seen any issues with them. Other than getting a nail in one, 3 days after buying them I've had no issues really. Not as grippy as the continentals the car came with but they're manageable if i don't drive stupid. EDIT: corrected date because it looked like i bought them in the future... with only a bit over a year on them to date with good rotation schedule, they're getting a lot more sketchy in wet weather. Gotta drive more sensible or i can feel them starting to lose it, haven't yet! they look like they're (chunking?) a little as well. also had a screw in the shoulder of one.. It seems to have a TINY leak. So i'll just be careful with it and get whatever i can out of it. Ya get what you pay for! Extras included w/ purchase: Purchased TPMS and Road Hazard. Out the door cost was somewhere around $650. Was alignment checked/adjusted during installation? No, but Orlando MINI did alignment after springs install at approximately 10,000 tire miles. Dry traction: A. Same as the stock run flats...I don't know anything else to compare it to. Wet traction: B. Ditto Bill. Road noise: D. They were fine the first 5,000 miles, but became louder than the run flats. Sometimes I would chuckle and think, wow that sounds cool. Other times, I would think, what the heck? Ride comfort: A. Gets an A compared to the run flats. I was beside myself with joy just driving out of the parking lot. Overall Performance: A. Except for the noise, these were good tires and fairly priced. Would you buy the same tires again next time? Since it seems that we will be buying tires every year, I am going to try the Continentals this time. Tire install scheduled for 3/29/13. We will see in a year if I go back. Aesthetically the tires look very sharp. After 22,000 miles there is still thread, but wouldn't chance the Dragon with them. Getting tire spin and squeal- fun for on/off ramps, but not so much when there is a cliff on the other side. Safety first, people.